I figured it was only fitting since I shared our explosive science experiment over on Writing Chapter Three today that I cover baking soda and all its awesomeness. We have a small box of the stuff that we use -- yes -- for baking cookies and other treats. Otherwise, we have a couple gigantic boxes for scouring and otherwise shining up our spaces and, well, ourselves. #1: Stain Lifter -- Have tough coffee or tea stains on your mugs? Just fill the stained area with water and sprinkle in some baking soda to let sit overnight. Should come out easily in the morning. #2: Scouring -- I love our Homemade Scouring Scrub made with just baking soda, borax, and salt. It's like the Comet my mom used to use when I was growing up, minus the horrible chemical after-shock. Great for bathrooms especially. #3: Stench Removal -- I think we've all read to put a box or bowl of baking soda in the fridge/freezer to keep gross food smells at bay. You can also sprinkle some in your carpet for a similar effect (let sit for 15-20 minutes before vacuuming up). #4: Kitty Helper -- Same goes with pesky litter box odors. We add about a quarter cup to our box and evenly distribute. #5: Outdoor Cleaning -- Adding baking soda to water (to create a thick paste) is just as effective as a magic eraser in a lot of instances. I see this majorly when cleaning outdoor stuff, like Ada's water table and other plastic toys or anything that gets a buildup of dark grime. Just keep scrubbing! #6: Soak Stinky Clothes -- If you have a tough load of sweaty, gross exercising clothing, you might consider soaking it overnight in a bucket full of water and a good 1/2 to 1 cup baking soda. Whether you use store-bought or homemade laundry detergent, this will help get the stink out faster. #7: Foot Soak -- Soften rough skin, deodorize, and relax with a simple foot soak. Just add a couple tablespoons of baking soda to warm water and let sit for however long you like. Add a couple drops of essential oils, too! #8: Shampoo -- Yup. We tried the whole No-Poo method of washing our hair a couple years ago. It worked really well for Stephen's hair. I never totally got used to it, though. But many people swear by washing with baking soda and rinsing with ACV! #9: Deodorant -- One of the main ingredients in my 5-Minute Natural Deodorant is baking soda. And this particular mix has worked well on my pits all summer long, even in the heat. #10: Teeth Whitener -- I don't use baking soda every single day, my dentist told me you can actually wreck your tooth enamel that way (and I don't have a lot, but that's a long story). However, you can routinely remove surface stains on teeth by brushing with a baking soda and water homemade "paste" -- here's more info. #11: Facial -- Again, I wouldn't use this mix every day on my face. But once a week? Try an exfoliating baking soda facial by mixing 1/4 cup baking soda + 1-1/2 tablespoon water. Scrub gently and don't get it in your eyes. Rinse clean. #12: Healthy Drink -- I don't know about this one, so I'd love you guys to fill me in. I've heard that drinking baking soda diluted in water can help with anything from UTIs to gout to kidney stones. Proceed with caution. #13: Playtime Fun -- Mix baking soda with vinegar to get a fun volcano effect that kids will love. Though some still combine vinegar and baking soda for cleaning -- certain ratios can be rendered ineffective since these two ingredients tend to neutralize one another. #14: Crayon Eraser -- Again, like a magic eraser, baking soda can be used almost like a magic eraser. Any stray marks and scuffs clean up with a thick paste and lots of scrubbing. #15: Air Freshener -- If you aren't keen on my vinegar solution for freshening up a room, try the baking soda way. Just combine 2 cups of water with 1 tablespoon baking soda and essential oils. 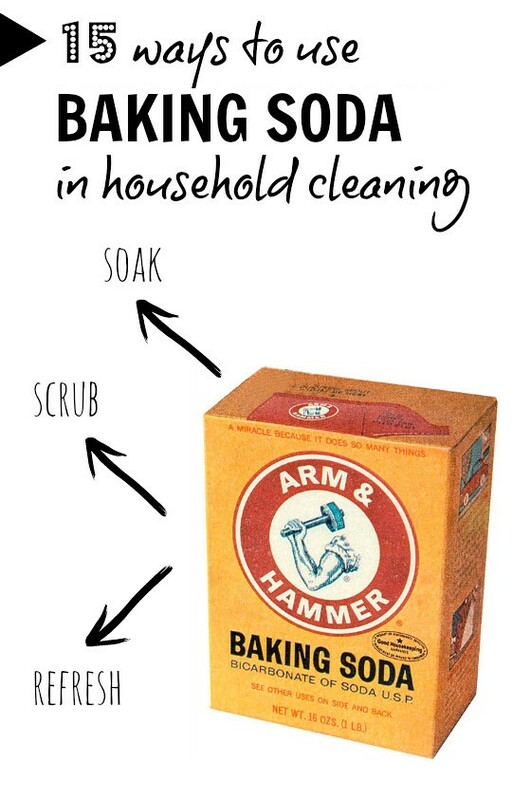 What's the smartest way you use baking soda in home cleaning?